Welcome to the official home page of Nappy Cake Classics. We create and deliver nappy cakes to any destination in Gauteng, South Africa. 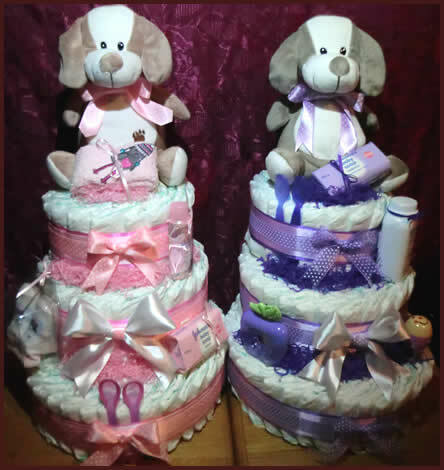 Nappy cakes are "cakes" that are made up of usable baby necessities (nappies, etc) that are traditionally used as an attractive display centrepiece at baby showers. They make excellent gifts for baby showers because they are both practical and aesthetically appealing. All the cakes are hand crafted, and are made uniquely for each and every client. We only use good quality nappies (i.e. Huggies and Cuddlers) and accessories. We have 5 years of experience in this business and lists of satisfied customers. View our prices and then place an order online, or by contacting us.